A lot of families out there have at least one member who was bitten hard by the Minecraft bug. My family has suffered greatly with the joy of Minecraft. We have been addicted from the first time we played it on Xbox 360. A few years and hundreds of hours and millions of blocks placed later, we are still just as addicted, playing on Xbox One. 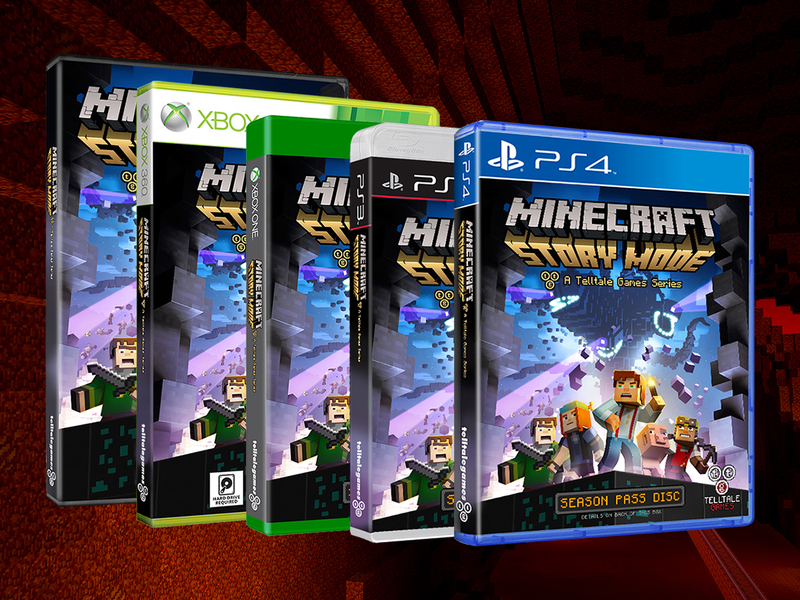 When we heard about Minecraft Story Mode by TellTale Games, we knew we were going to have to have it. The idea of a playable story featuring the pixelated blocks we all have grown to love, was a very exciting one. My husband and I have played a few other TellTale Games releases, and we've always quite enjoyed the game play and story lines. Most of TellTale's games aren't family-oriented, so we have never played them with the kids. Minecraft Story Mode is rated E10+, meaning it is appropriate for anyone over the age of 10. My oldest son was counting down the days and hoping to get Minecraft Story Mode for his birthday. After he opened it at his party, he was ready to get the party over with and get home to play. 12 year olds are not very well suited for waiting. We were barely through the door when we got home before all three kids were asking if they could play. Both in a need to save our sanity, and a need to feed our own curious excitement to see the game, we relented. 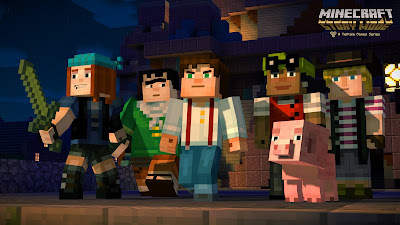 Even though Minecraft Story Mode is based in the Minecraft universe, it is quite removed from the block laying sandbox we all love. Being emotionally connected to Mintecraft, it's a lot of fun being able to play a story set in the Minecraft universe. It evokes feelings of nostalgia. You play Minecraft Story Mode as a very funny and likeable character named Jesse. You choose whether your Jesse will be male or female and you choose their appearance from a selection of character skins. Photo provided by Telltale Games. The story features Jesse and their group of friends. The friends are a rag tag group, each one representing a different style of Minecraft player: Warrior, Redstone builder, Builder, and Griefer. I thought this was a very clever and cute idea as it gives players a chance to see a little bit of themselves in the game. Game play progresses through solving puzzles, small battles and conversations. There is a lot of conversateing in this game. Conversations involve choosing a response from several choices, to which your choice has consequences to the story line and your characters development in relation to the game. 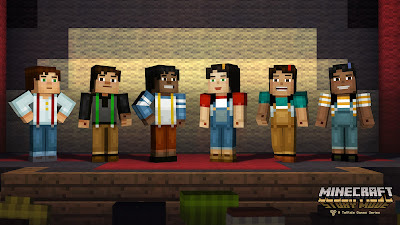 Minecraft Story Mode is an episodic adventure game that takes place over five parts. All five parts are available now. Each episode is a self-contained story within the whole of the game. Each one is a perfect little single serving that take a couple hours to play. While the game is aimed at younger players, it is fun for all ages. It's kind of like an animated film in that regard. It has something for everyone. It's also available to just about everyone, on many platforms: Xbox One, Xbox 360, PS4, PS3, PS Vita, PC, Mac, Wii U, iOS and Android. You can buy a season pass which gives you access to all 5 episodes, or you can buy each episode individually. You don't have to be a fan of Minecraft to enjoy Minecraft Story Mode. 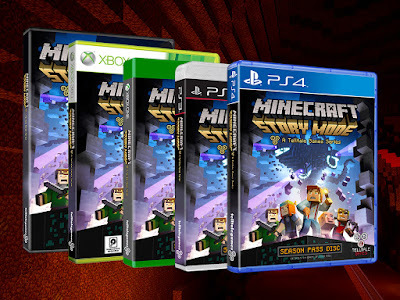 The two games run completely indpendantly of each other, so you don't have to have ever even played Minecraft to enjoy Minecraft Story Mode. Not a Minecraft fan. Would give it to my nephew. I personally have no idea about MineCraft, but I know my nephew is a huge fan... so would make for a nice gift with his birthday coming up in June! My kids are Minecraft fans. 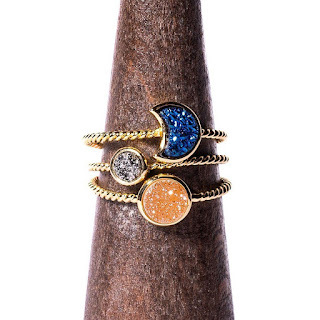 I would give this to them. I'm not a fan but I know a Garrett who would love to have this. Never played, but my son would love this! My son is.. he would LOVE this! I haven't played it. I would probably keep it. I am not, but my kiddo's are huge Mine Craft fans & our family just got an XBox One, so we don't have many games. This would be perfect for them to play together on those rainy April days! My son is a fan. I would give it to him. My grandson is a big Mine Craft fan, This would be for him. My daughter loves Minecraft so I would give it to her. My kids and my hubby are huge fans of minecraft. They play MC daily as their quality moment with each other. It is such an adorable sight to see them on the sofa screaming at the zoobies. I would give this to them. I would definitely enjoy playing this myself! My nieces and nephews love Minecraft. This would be for them! I like minecraft so I would keep it. I don't play it, but my little sister loves it so I would give it to her. My nephew is a big Minecraft fan, I'd love to win this for him! I am not a fan but I do watch my son play it occasionally. I would give this to him. I would give this to my son-in-law and grandson. They love Minecraft. I am not a Mine Craft fan, my young 11 year old son is a fan. He would get this prize if I won. My 6 year old daughter LOVES Minecraft! My grandson is a huge Mine Craft fan. While I don't know much about it, he would love this. My boys are obsessed with Minecraft. They would flip out over this prize! I am neutral and I would give it away to my brother because he likes things like this. My two boys would love this! They are big Minecraft fans and download all their other games through Steam. We don't have a gaming platform, so the fact that this is for the PC is perfect! Both my kids are Minecraft fans. I love the houses my daughter creates in her world. I haven't played minecraft yet but I'd give this to my nephew - he's a big fan. Yes, we are all Minecraft fans in the house! My son would get this game! My grandson is the fan. I would give it to him. It makes me dizzy, but both my son & daughter love it and even play together! I don't play but my 7 year old is a huge fan. My three boys actually just asked for this! Very cool! I would love to win! Our family has been bitten HARD by the Minecraft bug! And the boy plays it (story mode) on his tablet, but has been begging me to get it for the pc...but I'm stingy with the computer. I think I Would be selfish as hell and use it myself. my daughter is a HUGE Minecraft fan! YES! I am a newbie but my older grandson is insanely crazy about this game, he loves everything about it..
My son in law plays this game, so he would get it!! My sister is a minecraft fan. I myself haven't played. This would be for her if I won. If i won I would gift to my nephew! Big fan! Thanks for the chance to win! Both me and my nephew love to play Minecraft. I thank you for featuring the great PS4 giveaway. I would give it to our granddaughter. She loves Minecraft. My son is a Minecraft addict! I really don't know if I am a fan because I have never seen this game. But I know my eldest son is and that is whom I would give it to. I'd give this to my 9 year old son. He's obsessed with MineCraft.